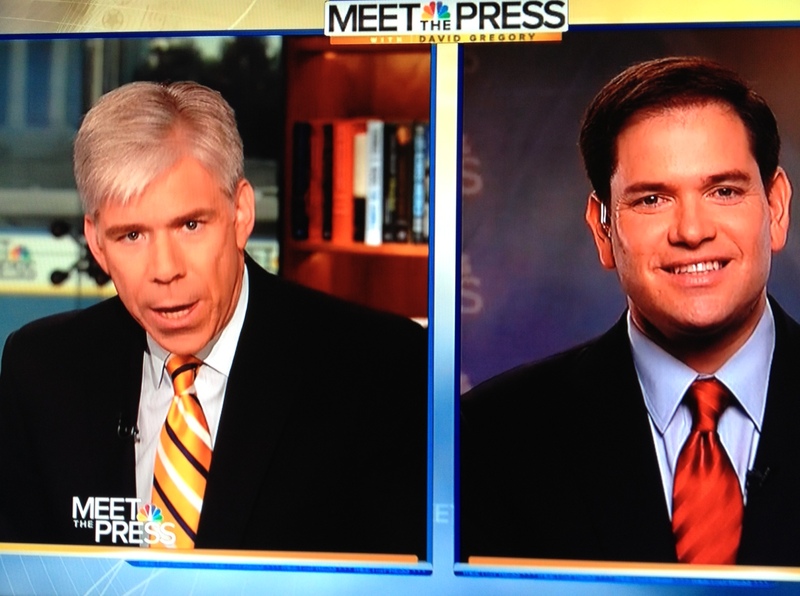 This morning’s Meet the Press began with Senator Marco Rubio (R-FL) who is appearing on all seven Sunday talk shows this morning. Rubio was vigorous in his support for a compromise immigration reform package he helped develop. He said the plan is both compassionate and responsible, and it allows undocumented workers to earn access to the legal immigration system. He said, “the status quo is horrible” for America. He also said his bill is a “starting point,” not a take it or leave it proposition. On gun-control, Rubio repeated his opposition for all current gun-control proposals. He said, “We have violence problem in America,” not a gun problem, and he said no one is talking about that. Rubio said he has no problem with the Obama administration’s responses to North Korean threats. He called again for a unified Korean peninsula. He also repeated his concerns about Beyoncé and Jay-Z’s recent trip to Cuba. In the roundtable, Senator Mike Lee (R-UT) said that he may be able to support bipartisan immigration reform proposals. However, Lee said he could not support the Manchin-Toomey compromise on gun control. He said it would do more to limit the rights of law-abiding citizens that it would to limit criminals. Senator Kirsten Gillibrand (D-NY) disagreed. Katy Kay of the BBC said she likes David Brooks’ observation. She fears, however, that once these proposals get out of the Senate and into the US House, the old dysfunction will reemerge. The program ended with a fascinating conversation about the movie “42” with Ken Burns, Harrison Ford, and Jackie Robinson’s widow, Rachel.